Aroma : Warming, dry, woody-spicy, pepper aroma. 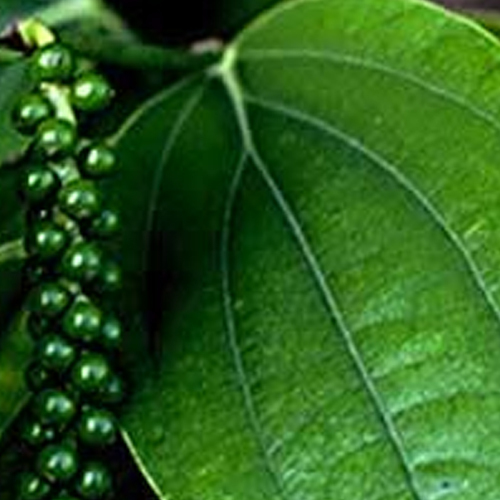 Black Pepper essential oil is obtained by steam distillation of dried, crushed Indian black peppercorns. Pepper black India oil is composed of various chemical constituents like a-thujone, a-pinene, camphene, sabinene, b-pinene, a-phellandrene, myrcene, limonene, caryophyllene, b-farnesene, b-bisabolene, linalool and terpinen-4-ol. Pepper black India oil is widely appreciated for its quality features and some of the best therapeutic properties. This warm and spicy essential oil helps in increasing the warmth of the body and mind, relieving sore muscles and joints, boost the immune and digestive system, stimulate the kidneys and disperse bruising by increasing circulation to the skin. Further, it also increases the flow of saliva, stimulates appetite, encourages peristalsis, tones the colon muscles and is a general digestive tonic. Moreover, these oils are good for Burners and vaporizers and also proves god for skin treatment. The therapeutic properties of black pepper oil include analgesic, antiseptic, antispasmodic, antitoxic, aphrodisiac, diaphoretic, digestive, diuretic, febrifuge, laxative, rubefacient and tonic. Black pepper oil may cause irritation to sensitive skins, and using too much could over-stimulate the kidneys. Moreover, this oil should be avoided in pregnancy due to its possible skin sensitizing effect. Black pepper oil proves great beneficial in the curing pain relief, rheumatism, chills, flu, colds, increase circulation, exhaustion, muscular aches, physical and emotional coldness, nerve tonic and fevers. Further, this oil increases the flow of saliva, stimulates appetite, encourages peristalsis, tones the colon muscles and is a general digestive tonic. Black Pepper oil blend well with bergamot, clary sage, clove, coriander, fennel, frankincense, geranium, ginger, grapefruit, lavender, juniper, lemon, lime, mandarin, sage, sandalwood and ylang-ylang. Black Pepper oil is specifically used to help with muscle tone, aching limbs and rheumatoid arthritis. It further helps to promote digestion, the colon as well as the kidneys. Moreover, this oil can be used in blended massage oil, or diluted in a bath, to assist with circulation, bruises, rheumatoid arthritis.